Classic Mary Jane style in a versatile slipper. 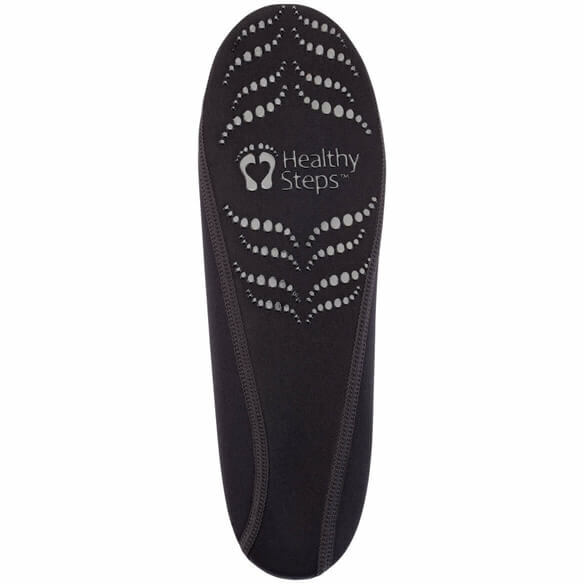 With an array of fun prints or basic black, these Silver Steps™ Mary Jane Non-Slip Slippers surround your feet in fashionable comfort when worn alone — perfect at home or while traveling. Wear the women's slippers over socks to add a layer of non-slip protection, or inside shoes or boots for extra warmth and cushioning without bulk. 4-way stretch neoprene/nylon provides a custom fit. Mary Jane slippers help prevent irritation, chafing and blisters. Water-resistant design helps feet stay dry. Resists germs to help keep feet clean and odor-free. Non-skid bottoms help prevent slips. Flexible design is easy to stash in a travel tote. Choose from 4 colors: scroll, polka dot, floral or black. 4 sizes: small (6–7), medium (7–8 1/2), large (8 1/2–10), XL (10–12). Hand washing recommended; air dry. I purchased these slippers because I need comfortable, NON-SLIP footwear. I have tried gripper socks which work well for a while then lose their grip. These seemed like a good solution but they have NO GRIP at all. In fact I thought they were more slippery than walking around in socks. Although these slippers are very comfortable, they are dangerously slippery. I will be returning them. I don't understand how you can sell a product like this...I actually think it's really slippery! This is false advertisement! These are fantastic non-slip slippers. Great for around the house or slip into your shoes. I have 3 pair a very satisfied customer. I have had them before and I just really like them. Have had many pairs. They are comfortable and a great value. I have been having a lot of foot problems and these slippers were recommended to me to try. Great to wear on airplane!! For my mother with Parkinson's Disease. Need something I can wear in the pool. Hope these work. Replacing old ones. Good price. my Dr. told me not to go bear footed, so I bought these! Good support for your feet and your legs. I fell very hard because of unexpected water leakage in my home. A single fall can be a life-changing event and this slipper product is the best prevention for a next and what would likely be a more damaging fall. Like product, but almost didn't buy because of "handling charge" Price your products without gimmicks. Mary Jane Slippers are great for pool walking. Diabetic and always need to wear something on my feet. These fill the bill nicely. the shoes appear to be easy to slip on. I've been using this product for some years now. I'd like to find more variety. I have purchased these slippers and have been pleased with them. I want these for wearing around the house - usually go barefoot. Another pair for ease of putting on and comfort for my elderly mother-in-law. tHEY LOOK COMFORTABLE AND BETTER THAN BULKY SLIPPERS. Have one pair and love them. very comfortable on the feet. They look comfortable. With winter coming, I wanted something to keep my feet warm that would not be bulky. Comfort when walking in the house. Whare is your size chart for slippers 358233? BEST ANSWER: Thank you for your question. The 4 sizes: small (6–7), medium (7–8 1/2), large (8 1/2–10), XL (10–12). We hope this information will be of help to you. Do you have similar non-slip slippers suitable for a tropical climate, preferably with more open ventilation such as holes in stead of the printed dots on the material? BEST ANSWER: Thank you for your question. Unfortunately we do not have such slippers. We hope this information will be of help to you. Would these fit a EEE width, For women? BEST ANSWER: Thank you for your question. These will not be able to fir a EEE foot. We hope this information will be of help to you. What shoe size is S, M, L ? BEST ANSWER: Thank you for your question. Sizes: small (6–7), medium (7–8 1/2), large (8 1/2–10), XL (10–12). We hope this information will be of help to you.